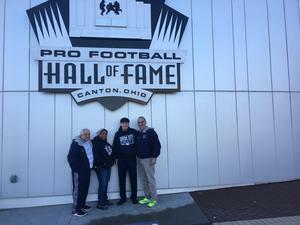 The Union City Chiefs youth football team had a sensational year, from becoming State Regional Champions all the way to playing at the Football Hall of Fame in Canton, Ohio. The undefeated 14U Union City Chiefs put 176 points on the board this season, while allowing their opponents to score only 6 points. With a 7-0-1 record, the team competed in the Northern Atlantic Tournament. Regional Director Rich Notillo surprised the Chiefs with an invitation to compete on November 29th-December 2nd in Sparta, New Jersey, for a chance to win a world youth championship. The Chiefs played among some of the top rated youth football proudly. Head Coach: Roberto Massa, Asst. Coaches: Andrew Pallotto Jr., Marc Molina, Jose Artiels, Eddie Martinez, Jeffery Patterson, Julio Yunes, Bruce Maila, Emil Delgado, Roberto Pena.